A new year of books and book reviews! I’m hoping to match my reading and reviewing goals from last year and do them one better (i.e. 51). These three books were a great start to the year. People of the Book by Geraldine Brooks is an enthralling fictionalized account of the history of a book, the Sarajevo Haggadah. The story starts in 1996 after the ceasefire in the Bosnian War when a rare book conservationist is brought in to restore the illuminated Haggadah, the book Jews use for the Passover seder. While taking apart and then re-binding the book, Hanna Heath finds a few clues that might shed light on the remarkable history of the book that spans 500 years of European history. Interspersed between the main narrative of Hanna’s sleuthing are short pieces from the book’s history such as when it was saved from destruction at the hands of the Nazis during WWII. Other moments give glimpses into Vienna in the declining years of the Austro-Hungarian empire and Spain at the time of the expulsion of Jews in 1492. It’s all rather riveting as the moments are about people—Jews, Muslims, and Christians— who have some connection to the book. I’m kind of a sucker for books about loving books, at least if they are done well (e.g. Elizabeth Kostova’s The Historian, Diane Setterfield’s The Thirteenth Tale, or Umberto Eco’s The Name of the Rose). It’s not very deep, but I enjoyed it a great deal. Mrs. Dalloway by Virginia Woolf is a book I’ve read before and hope to read again someday. In other words, it’s a classic, and deservedly so. It’s a novel that somehow encompasses so much of life even though the main action only takes up a day. Periodically we hear the tolling of the bells marking the hours of a day in London of 1923. It starts with one of the famous lines of literature: “Mrs. Dalloway said she would buy the flowers herself.” From there, we follow Clarissa Dalloway (and other characters) through all the preparations for a party that evening at her residence. The guest list includes the Prime Minister, revered physicians, pompous bureaucrats, a poor cousin, an old suitor of Clarissa’s, and one of her oldest friends who, though living in Manchester and thus uninvited, happened to be in town and came anyway. Running parallel to the story of the events leading up to the party is the story of Septimus Smith, a veteran of World War I who is suffering from shell shock (what we would now call PTSD). Through the use of flashbacks we find out some of the backstory of how Clarissa chose Dalloway instead of her old suitor, and how Septimus is haunted by the memory of his officer who was killed in the war. The narration floats and glides from character to character, in and out of minds, seamlessly transitioning from one to the next, like a butterfly flitting here and there. It can be disorienting, but it is also so fluid. We get to experience life through so many eyes and minds. It’s exquisite. It’s not an easy read despite being a tad under 200 pages, but it’s totally worth it. Our List of Solutions by Carrie Oeding is a collection of poetry full of longing and insight and barbecues. One thing I noticed is that this collection works as a cohesive book and not merely a random selection of poems by one author. Characters and objects and themes recur throughout the book, filling out the neighborhood feel to the proceedings. There’s Sandy who says “No more!” before being introduced to the concept of Beauty by a neighbor and finally closing the book with her own list of solutions. There’s the neighborhood barbecues where people eat meat and someone is always on the edge of the group, where there’s gossip and someone disappointing someone else. And then there’s the way the world works, first its prelude and then its understanding. It’s an understanding that’s really a curse. to just watch those in the world who don’t know how it works. Of course those aren’t the only two options, and that’s not the only way to curse. It’s a complicated book, and these are intricate poems that don’t follow the same narratives or structures I’ve seen before. A speaker in one of these poems is just as likely to imagine a lengthy discourse on a new enemy before fumbling towards complete stasis as imagine that an old high school band mate had the key to beauty and freedom in a great bike metaphor, but that it was now lost. The poems do new and interesting things like revise themselves as they go along as in “Ruby, Give Leo One More Chance”: “You can know a person […] You can know a person too well. You can know a story. / You can feel nothing at all. // I can walk up to a stranger and, and I— / who cares what I could say. / This isn’t about talking to strangers.” It’s intriguing, and it’s a neighborhood I’d like to visit again, even if all the deer have left. The August installment of brief book reviews includes the work of a southern poet, John Hersey’s classic on the devastation of the first atomic bomb, and a meditation on church. Searching for Sunday: Loving, Leaving, and Finding the Church by Rachel Held Evans is a mix of memoir and a meditation on church. The book is structured around the seven sacraments (baptism, confession, holy orders, communion, confirmation, anointing of the sick, and marriage), which helps hold the fragmentary nature of the chapters together. In her earlier memoir she talked openly about her doubts with Christian faith that led her to adapt; in this new memoir she details how she left the evangelical church she grew up in, struggled to attend any church for a time, tried and failed to start a church, and then found solace in the Episcopal church. As I said in my earlier review, I could relate in the broad strokes with her experiences (I, too, have found solace in the Episcopal church). But I really appreciate that Evans doesn’t repudiate her evangelical upbringing. For her, it’s the community that introduced her to Jesus and still part of the universal church, so she can’t turn her back on it. I also appreciated her honesty when talking about her judgmental attitudes about churches she would visit. She talked about how she would intellectualize everything and remain aloof in her pride. Her awareness was welcoming and a reminder of my own judgmental attitudes. Later, when discussing the incident in the gospel of John where Jesus refuses to condemn a woman caught in adultery who the Pharisees bring to him ready to stone, Evans discusses judgmental attitudes within the church. She had been talking about sin-sorting: the habit of classifying some sins as worse than others in order to feel better about our own sins. She points out that some use this story of Jesus and the woman and what he tells her at the end (“Go and sin no more”) when they think the church is being too soft on sin. She counters that kind of thinking: “I think it’s safe to say we’ve missed the point when, of all the people in this account, we decide we’re the most like Jesus. I think it’s safe to say we’ve missed the point when we use his words to condemn and this story as a stone” (94). To me this is a strong reminder of the example of the grace Jesus gives that Christians are supposed to emulate. I thought this book was stronger than her first. I’d definitely recommend it. Hiroshima by John Hersey is one of those classics that I always knew I should read, but never did until now. I was prompted to pick it up by seeing articles and blog posts on the 70th anniversary of the devastation. I can see why it is a classic. In a plain reportorial style, Hersey tells the stories of six survivors. It begins a few hours before the bomb hits, and then follows the six individuals through the rest of the day and the ensuing aftermath. Hersey never interjects his own thoughts, letting the details of the injuries and deaths and wreckage and destruction and sickness and weariness inform the reader. We see the other burned survivors wandering around the streets (many of whom died later of wounds or radiation sickness); we see the destruction of homes, hospitals, factories, and churches; we see the shadowy outlines of those vaporized in the initial blast. And though this is a survival story, we see death everywhere. It’s important to reckon with this, look at the death and destruction square in the face. As an American, this is my legacy: America is the only country to have used atomic weapons. Now some argue that it was necessary, that there was no other way to end the war with Japan, that it was a psychological weapon as much as a physical one. But even if we grant all that, allowing the dropping of two atomic bombs as the least of all evils, we still must look at the evil those bombs wrought. (And this says nothing about the firebombing of Tokyo and other Japanese cities before the final two bombs.) I did not read the fifth and final chapter called “The Aftermath,” where Hersey revisits Hiroshima forty years afterwards and tells what has happened to the six survivors in the meantime. My copy appears to be a first edition from 1946, though the story itself was published first in The New Yorker a few months before being rushed out separately as a book because of great demand (the original New Yorker article can be read at the link). This is a book everyone should read. We Almost Disappear by David Bottoms is the most recent poetry collection from a southern poet I’ve liked for a while now. Here’s a quick taste: “[O]ther than gratitude / so little survives the world’s chronic revision—a boss line, maybe, / from a poem you’ve forgotten, a penny / you picked up in an alley / for luck, / a voice that blessed you in passing.” (from “Romanticism I”). It’s a collection that is concerned with the passage of time and the themes of aging and family. Early poems recollect the poet’s early days and memories of his grandfather. One whole section later in the book concerns the poet’s aging father, with many of the titles describing him as “my old man,” as in “My Old Man Loves Fried Okra.” That particular poem shows the painful moment when someone loses a defining characteristic to age: the speaker’s father is too tired to thank the church lady for bringing over fried okra, and even too tired to eat it. Another section takes up the poet’s relationships with his wife and daughter, and it had my favorite poem in the whole book: “My Daughter Works the Heavy Bag.” In this poem, the speaker observes his fifth grade daughter in karate class as she negotiates the physical movements of the martial art and the social movements of being the only girl in the class. The images at times are perfect: “Again and again, the bony jewels of her fist / jab out in glistening precision.” I discovered Bottoms, the former poet laureate of Georgia, from the recommendation of a friend in grad school. He told me to read Under the Vulture Tree, and after I did I was hooked. The collection was full of boss lines; see for yourself in the poem “Under the Vulture Tree.” This latest collection isn’t quite as good, but it’s still worth checking out. In our backyard the lilacs are in bloom. Their sweet smell is one of the best things we inherited from the previous owner of the house (the thistles we could do without). 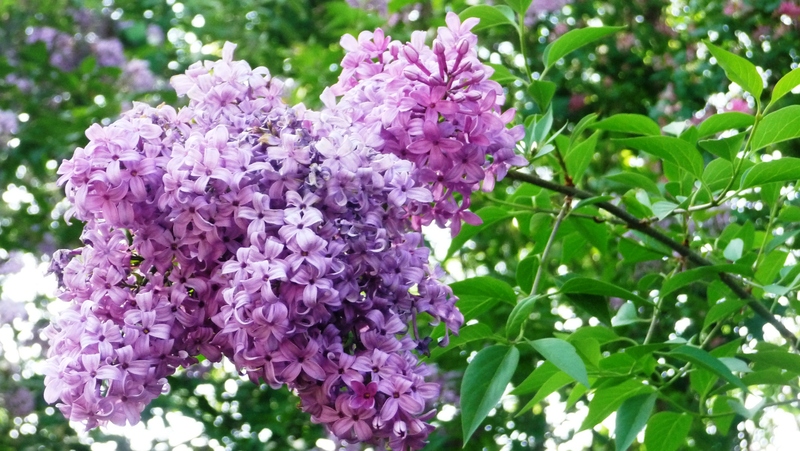 I don’t remember noticing the smell of lilacs before, whether because of ignorance or inattention, but now I don’t think I’ll forget their scent. The sense of smell is strongly associated with memory and can stir up strong thoughts as they did for Whitman. For me, cigarette smoke always brings my grandma and her house on the lake to mind. But Lincoln is a different matter for me. He does interest me, probably because of the unique period of the time, a time when the country was at declared war with itself. The country was built and prospered because it enslaved millions of Africans. But the Civil War was a turning point in the ongoing story of our nation as it relates to African Americans. It’s a story that is still unfolding, from Reconstruction to Jim Crow to the Civil Rights movement to mass incarceration and the Drug War of today (with many other aspects of the story that I’m leaving out). I wonder how the post-bellum years would have turned out if Lincoln hadn’t been killed. His vice president, Andrew Johnson, a Tennessee Democrat, was the worst person to be in charge of putting the country back together after the war. How successful would Lincoln have been? Would he still be beloved as the savior of the Union if he had presided over the tough conflicts of Reconstruction? In some ways, his murder froze him in time right after the war ended. The Union had been saved, the slaves had been freed, and it was all because of Lincoln. The narrative had been fixed for all time. I’m also interested in Lincoln because we named our third child Abraham, in part because of the positive associations with the 16th president (we had other reasons, too). Perhaps I’ve burdened him with the association. I can see the appeal of inventing a new name for a child so that he has no expectations to live up to, no weight to live under. He only has to be himself. But I’m going to continue to read about Lincoln, the Civil War, and Reconstruction, while striving to let my son grow up and be himself. The lilacs have already begun to droop, and the petals are falling to the ground. I’ll have to wait until next year to smell their sweetness again. Last week I received a mysterious call from Pine Island, MN. After listening to the voicemail, my confusion cleared. It was the basement waterproofers calling to confirm the dates of the work crew coming. But the mention of Pine Island on my phone’s caller ID made me think of the poem by Wright, which in turn made me think of its cousin, the poem by Rilke. Both poems turn on their last line and go big. Definitely ending with a bang and not a whimper. One a pronouncement of regret, the other a call to arms. It’s the kind of trick a poet can only pull off once; to try it again would be to negate its effect. I almost feel that putting them side by side like this does the same thing, canceling each other out. So why put them together? Their differences are interesting. One is an encounter with nature, the other with art. In one, the viewer is ignored by the surroundings; in the other, the viewer cannot escape the gaze of the sculpture. In the first, the speaker despairs; in the latter the speaker compels the listener to transform. While I like these two poems very much, the bold pronouncements they end with don’t appeal to me as much as they did when I was younger. It’s not that I’m immune to the warning of wasting my life and the exhortation to change, it’s just that I’m more likely to listen to a quieter voice now. Does this mean that I’ve grown complacent, settling into middle age? I don’t like to think so, but it’s hard to rule out. Now I’m a homeowner who has to call specialists to help us keep water out of our basement. and I told you twice to remember that. You told me you never listen anyway. written on my face, shallow and flat. I told you to forget the words I say. to find the difference between chien and chat. You told me your French is rusty anyway. So then I tried some Spanish andale! in tongue—just forget the words I say. you weren’t even listening anyway. I love and hate you. I listen. I pray. The words didn’t stir you; you still sat.